What you see on the plate above you is my version of a dish I recently had at a restaurant called Mado, which opened recently in Wicker Park. The emphasis there is to use local, sustainably grown foods. I read that they also use whole animals which they cut up themselves, and use completely. Which would explain the delicious hangar steak I first heard about from Kevin over at Consumatron and tasted for myself. It was as delicious as Kevin said it was, although the gorgonzola-polenta could have been a little better blended. But that's a minor complaint. But for me, the main star of the meal was a simple little dish consisting of grilled corn kernels served with butter and smoked sweet paprika. One bite of that and my "duh" factor kicked in - I have all of the ingredients in my kitchen and I have been buying corn like it's going out of style for the past few weeks - why didn't I think of this? No problem - it's become a staple on my table ever since. And I get a little kick knowing that my corn comes from the same green market as the corn Mado uses, if not from the same purveyors. You don't really need a recipe for this dish. 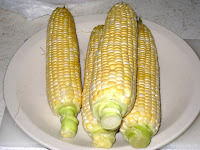 Just cut the kernels from the cobs (I used my microwave method instead of the grill), add some butter or Sonoma lemon-infused olive oil, smoked sweet paprika and salt and pepper to taste and you're in heaven. Here are four cobs just out of the microwave. I trimmed off the bottoms, rinsed them under cold water, and cooked them on high for five minutes. You want to peel them right away. Simply peel them under cold running water and you won't burn your hands, but the cobs stay nice and hot if you want to eat them whole with butter melted all over them. Yum! Another advantage to cooking the corn in the husks is that the silk comes off much easier after they're cooked, especially under the cold running water. 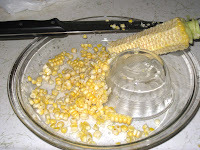 If you want to cut the kernels off, however, let them cool off . This picture is mostly gratuitous, but I wanted you to see how fresh this corn is. 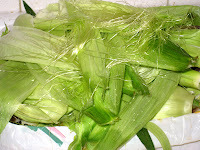 See how thick and green the cornsilk is? And that's one day after I brought these babies home. Imagine how old the fresh corn is that you are bringing home from the grocery store. Next, you need the proper equipment. I had to search high and low for the perfect corn kernel remover - oh wait! I didn't. I simply used a pyrex pie plate and custard cup, both of which I've had for years. 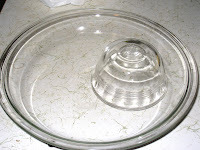 If you don't have these two items, simply find a shallow (preferably glass but it's not necessary) plate-size dish and a small invertible bowl. Grabbing an ear of corn and holding it firmly in both hands, snap it in half. It might feel like some of the kernels are getting squashed, but don't worry about that. Just keep going until the ear breaks. Set one of the halves on the inverted cup. The broken center helps keep the ear steady. 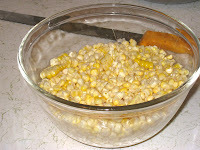 If it is leaning a little too much to one side, just remove some of the kernels on the other side. You can put those into the dish, but I just eat them. What knife you use is important. You want a sharp knife. As you can see from my knife, it is a thinner one. I don't know the technical term for it, but it really doesn't matter because you're going to use whatever knife works for you. As long is it is sharp and has enough heft for you to hold it steady in your hand, it should work. 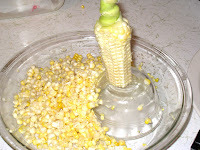 Holding the upright ear steady with one hand, take the knife and apply it just under the top row of kernels. Run it down the edge of ear, applying just enough pressure to keep the knife where the cob meets the kernel. 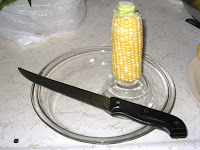 Move the knife slowly down the cob (or the kernels will fly all over your kitchen), letting the kernels fall over the knife into the dish. Here's one half of an ear finished. Put the other half on the bowl cut side down and cut the kernels off of it. And here's the last ear. Every once in a while, as the dish fills up, just empty the kernels into a bowl. This is a six-cup bowl, so you can see that I have a nice amount of corn here. There was enough for me to make a lovely corn casserole. I used the rest for the corn with lemon-infused olive oil and smoked sweet paprika up at the top of this post. So what are you waiting for? 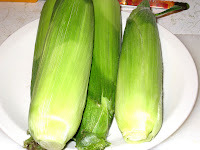 Now that you see how easy it is get yourself down to your local farmer's market, buy a bunch of corn, cook it up, shuck it, cut off the kernels, and have yourself a beautiful corny time. I'm glad you got the chance to check out Mado. I've had the polenta twice now and have noticed that the batches tend to be uneven. As for the corn dish... is that a side there at Mado? Sounds great, but I don't remember seeing it. The menu changes so often, it may have been something new since I last ate there. Oh well, I guess that means I'll just have to go back and dine there again! I was quite pleased with my overall experience at Mado, Kevin. 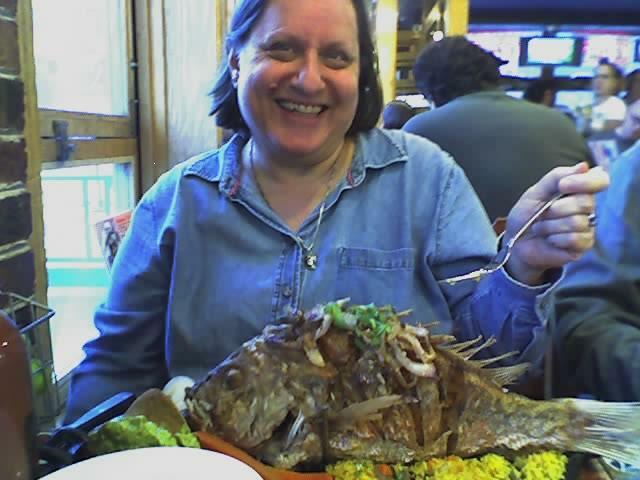 There were eight of us so a wide range of dishes were tasted and everything was good. The corn was a side dish the night we were there (some 2 weeks ago by now), and I was not at all surprised to see it on the menu given the abundance of it all over the green market for the past couple of weeks. The hanger steak was definitely the star of the evening for me, but the corn was a close second. If you do have a chance to go while they have it on the menu, you should definitely try it.